3D scanning has featured a few times on my blog (eg. see my custom virtual reality headset which perfectly fits my face), so it was only a matter of time until I bought a scanner for myself. Earlier in the year Kickstarter convinced me to help fund the Ciclop 3D Scanner from Cowtech, a $99 open-source system that was impossible to refuse. Yep, $99! Well here it is, built over a couple of days and making me feel like a kid again with a new kit of Lego. I bought the cheapest version of the scanner, choosing to 3D print the components myself (naturally!) which can be freely downloaded from Thingiverse. These worked really well, only a few areas where support material was time-consuming to remove, and were all done on the small build plate of the UP Plus 2. The top left photo shows most of these 3D printed parts (12 in total needed). After receiving the other scanner hardware from Cowtech this week, it was finally time to put this kit together – no simple task after I snapped one of the key parts early in the assembly process! You can see the 2 broken pieces of acrylic to the left, which are both from the long arm connecting the 2 main octagonally-shaped hubs in the middle photo at the top of the page. So far Araldite seems to be holding them, and this snapping seems to be a common problem people are reporting – maybe a bit better tolerances required in the laser cut pieces, or a different material that’s not quite so brittle. Otherwise the assembly process has been quite straight forward, the video provided by Cowtech is very easy to follow, especially if you’re a little familiar with Arduino’s. There are some really clever details in the way nuts slot into the laser cut pieces and screws slide through the 3D prints that I’ve never seen before, so as a designer it was fun to discover these details. I really appreciate the tolerances for many of the different parts fitting together, from laser cut to 3D print to machined screws, I am honestly surprised how well they all came together for me. So in the top right image you can see the final result – I have to admit I feel like an extra 3D printed part is required to cap off the top above the camera, it doesn’t look right to me so this might be something I make myself soon. The challenge I’m having now is that I can’t get my camera to be recognised by the recommended open-source software for the scanner, Horus. I’ve spent hours installing software and drivers, rebooting my computer, uninstalling, installing in a different order, rebooting… Nothing is working. Hmmm, a bit frustrating but as I’ve learned with these sorts of new products from Kickstarter, sometimes it can take some time for people to start posting solutions and updates as my order was dispatched quite early and there is just not much up on the forum yet. Hopefully soon! Keep an eye out on my blog for updates, and hopefully soon some successful 3D scans! After some ideas from the Cowtech Facebook Group, I have solved the connectivity problem – hopefully it helps anyone else that reads this. Firstly the Cowtech Scanning Guide says to plug in the camera to set it up in Horus – but you actually need to plug in the entire scanner – 2 USB’s and power. I then went into the preferences, selected the appropriate camera and serial, then changed the Arduino type to “Arduino Uno” and clicked “Upload Firmware” (shown left). I had to close and then re-open Horus, but now it’s all up and running. Hopefully the rest of the calibration goes a little smoother. I think the instruction booklet from Cowtech needs to make this clearer, and include these preference changes. It’s been a busy month for me and 3D printing even though it’s meant to be the mid year break from uni! Above are some photos from a full day 3D printing workshop I ran for a local high school in our new 3D printing lab, with a handful of students all being exposed to CAD, 3D printing and 3D scanning for the first time. By the end of the first session each of them had their first small design 3D printing over the lunch break, which just shows how quickly young kids are able to pick up this technology. We were also able to demonstrate for the very first time one of our brand new chocolate 3D printers, the Choc Edge. Yes that’s right, a chocolate 3D printer! I’m sure it won’t be long before everyone has something like this on their kitchen bench, but for now if you want to see how they work, come along to our Gold Coast campus open day on July 24th where we will have 3 in action for your sugary delight! Last night I was really privileged to be a speaker at an event called DRIVEinnovation, hosted by the Brisbane West Chamber of Commerce. As the name suggests, the discussion was all around innovation, and how businesses can better adopt new technologies and keep up with the rapid changes across all industries. I was part of a panel with Ty Curtis from local augmented reality company Activate Entertainment, and Sam Forbes from cloud services company 6YS. The questions were certainly challenging in the short time-frame (how do you even begin to describe how to innovate in just a few short minutes? ), but it’s really great to see such an active council asking these questions and building a community of very talented people. There were even some virtual reality and augmented reality demonstrations (that’s me in the right photo looking at a human skeleton with augmented reality). If you’re in the local area, it’s definitely worth following the Chamber through email or social media as these events happen every few months. I will of course be running the 3D printing workshops, and there will be 2 levels of workshops each week: Workshop 1 is for beginners to CAD and 3D printing, where people will get to build a functioning product assembly. Workshop 2 is for more intermediate users who have some experience with CAD and 3D printing, and we will be combining this knowledge with 3D scanning to create wearable devices. If you’re interested, get in touch and I’ll pass on details to the administrator organising the event. My idea with this particular design has been to address each of these issues separately through the power of 3D printing. So firstly, the main headset uses the 3D scan data of my face – this could easily use anyone’s face, creating a perfect fit. Secondly, the lenses have been located in the correct position for my eyes, and focal length of the lens used. Again, this could easily be adjusted to suit anyone’s eyes and lens. Thirdly I have created a separate frame to hold the phone which snaps onto the main headset. A variety of these could be developed to hold any phone model. In essence, I’m imagining a VR headset that can be customised to suit anyone, and modified as they upgrade their phone using modular components. While the theory is all good, this particular print isn’t perfect – it’s only the first prototype. There is some distortion in the main headset where the print began to lift off the plate during printing, so modules don’t perfectly fit (this is exacerbated by the fact I had to split parts to fit on my Up! Plus 2 printer and glue them after). The lenses aren’t 100% perfectly located, distorting the image. It’s close, but when you’re dealing with lenses close enough is not good enough! So maybe a small amount of adjustability will need to be built in. The phone is also a little loose in the frame, but this is an easy fix. So plenty of work to go, but at the same time an exciting start! If you want to check it out it will be at the Brisbane Virtual Reality Club‘s next meeting. Since playing around with some 3D printed Virtual Reality headsets recently (previous post here) I’ve been interested to see how easily a 3D scan can be used to create a perfect-fitting headset. One of my biggest problems with the designs out there is that they’re pretty uncomfortable, especially if you’ve got a big European nose like me! 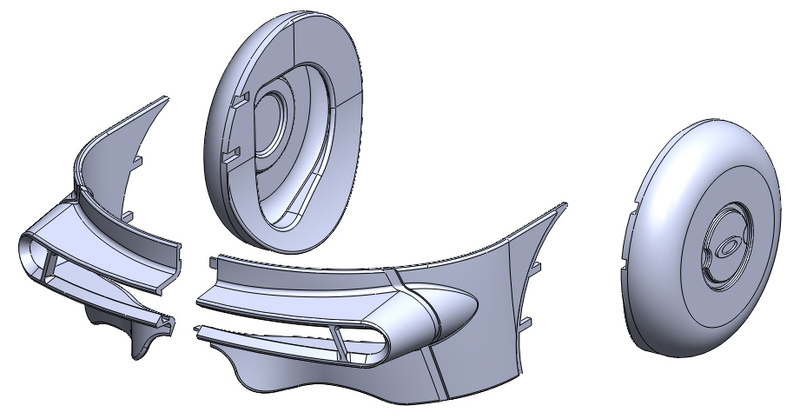 One of the true benefits of 3D printing is the opportunity to customise a design, and 3D scanning fits perfectly within a designers workflow to do this. While the most accurate scanning technology may not be readily accessible to most people yet, it’s certainly not far off with a multitude of Apps and kickstarter projects hitting the market, so I’m interested to experiment with what can be done. Thanks to the legendary Chris Little, aka. 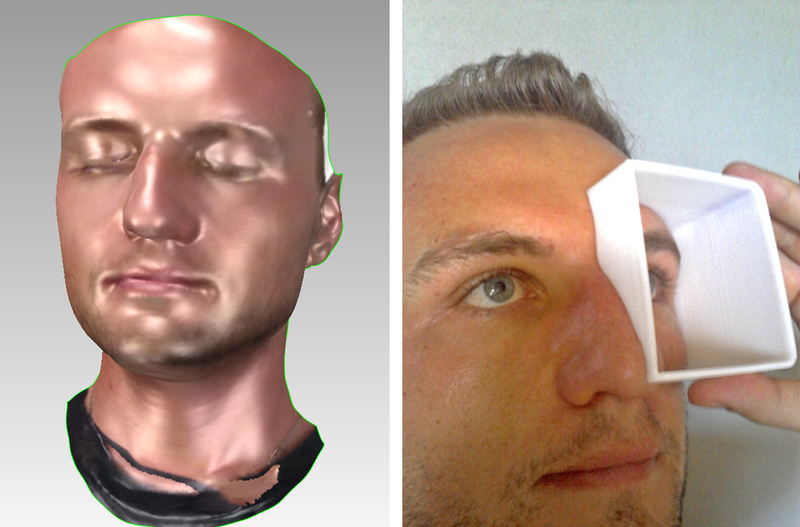 Golden Boy, who scanned my face using a handheld photogrammetry-type 3D scanner and spent a fun weekend processing the data, I now have a digital surface of my face to build 3D models with (image 1). 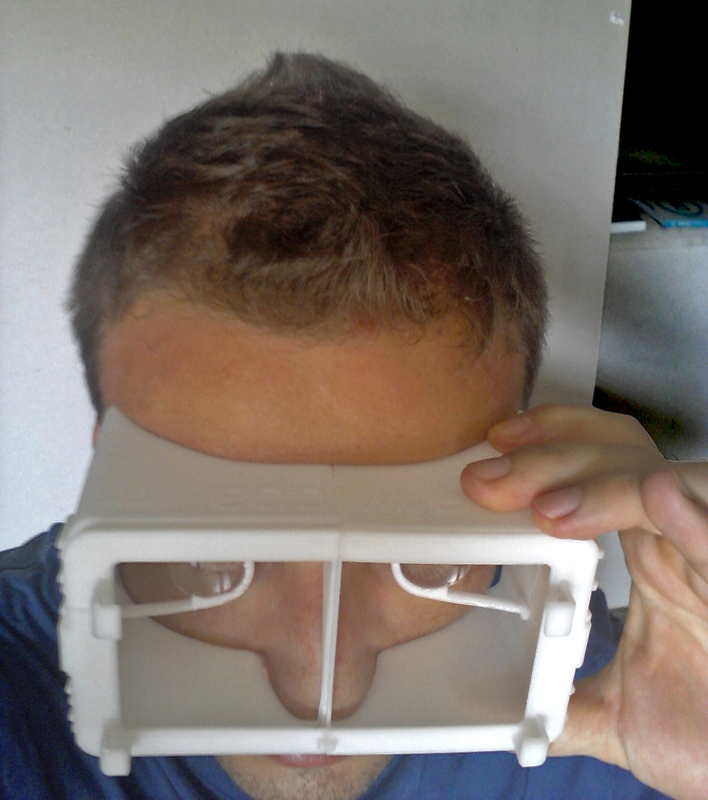 In order to test how accurate this scan is to my actual face, I quickly modeled a part that mimics a simple virtual reality headset and 3D printed half of it on my Up! Plus 2 3D printer. Perfect fit! This means that not only will 3D models fit my face, but I can accurately measure things like the distance between my pupils and account for this in the placement of lenses within the design… All exciting things to come!